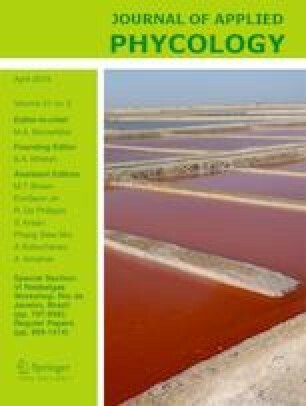 Spatial and temporal variation of biochemical contents and their relation to carrageenan yield (SRC) of cultivated Kappaphycus alvarezii at three different places, viz., Mangadu, Munaikadu, and Vedalai of Palk Bay waters, Tamil Nadu, southeast coast of India, was studied from April 2012 to March 2013. The maximum protein and carbohydrate contents were found to be from 117.36 ± 4.04 to 125.93 ± 1.49 mg g−1 DW and from 219.01 ± 10.83 to 250.71 ± 10.75 mg g−1 DW, respectively, while chlorophyll a, carotenoid, phycoerythrin, and phycocyanin contents varied differently among the three sites. Two-way ANOVA revealed that protein, carbohydrate, chlorophyll a, phycoerythrin, and phycocyanin were found to differ insignificantly both spatially and temporally, while SRC yields were found to differ significantly both spatially (p = 0.038) and temporally (p = 0.008). Carotenoids were significant only spatially (p = 0.001). Carrageenan yield was significantly correlated with chlorophyll a (r = 0.648, p < 0.05) and phycocyanin (r = 0.819, p < 0.01) at Mangadu, and with phycoerythrin (r = 0.728, p < 0.01) and phycocyanin (r = 0.623, p < 0.05) at Vedalai. Among the macroelements, Na recorded the highest value. Maximum mineral content (Macro elements) was recorded at Munaikadu with the minimum at Vedalai. The seaweed may be recommended as a potential candidate to be used as food or in food formulations as an ingredient to improve the nutritional value of the food as it possessed a considerable amount of protein and macro- and micronutrients. The authors would like to thank Dean and Director, CAS in Marine Biology, Faculty of Marine Sciences, Annamalai University, Parangipettai, Cuddalore (District), Tamil Nadu, India, for their encouragement, interest, and facilities provided. Thanks are also due to the higher authorities of Annamalai University, Chidambaram, Tamil Nadu, India, for rendering timely help in the execution of the work. The authors wish to thank the anonymous reviewers of this paper for their valuable comments resulting in excellent interpretation of the work.